We can make baked or raw bars and are always looking to expand our expertise. If your bar idea isn’t here, don’t worry this list is just an example. Call us to discuss your ideas. We have been certified by the Soil Association since 2002. We have a comprehensive understanding of organic certification and can help you to achieve certification for your product. Fullwell Mill Ltd are pioneers of Fairtrade, not only in Britain but across the world. Our understanding of Fairtrade is second to none and we can work with you to achieve certification for your product. We can produce low carb, high protein, low fat and low calorie bars. We have worked with some of the biggest diet brands in the UK. A flapjack or cereal bar, which is a made from oats or other grains. This may be oaty, fruity or nutty. We can make bars with milk and plant proteins such as whey, pea, hemp, soya and rice. We made the first energy bar in the UK in 1993 and have been a leading energy bar manufacturer ever since. 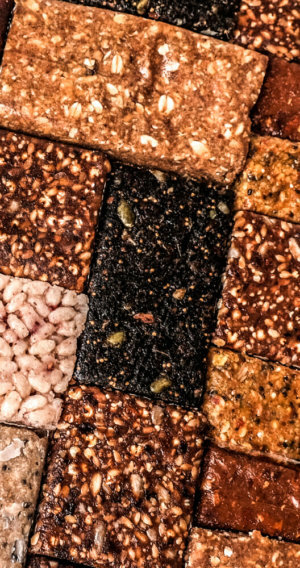 In 2001, we produced the first functional food bar in Great Britain for a leading health brand and still produce for them today. Functional bars provide you with a health benefit and we can offer you ingredients such as apple fibre, vitamin C, and omega 6. We can develop products to support numerous health claims such as high fibre or no added sugar. We produced the world’s first 100% Fairtrade and organic fruit bar. As a major dried fruit importer, we are used to working with sticky, tough and difficult fruit products. Making a 100% fruit bar is a doddle for us.